Hope you enjoyed my quick tour of this fabulous market! P.S. – Sam at Beck’s & Posh recently did a post which surprisingly discovered that some items are cheaper at the farmers market than at Safeway (the large grocery chain in California)… so support your local farmers, the planet and sustainable agriculture! P.P.S. – I just found this great farmers market icon – “Blush the Sweet Tomato” at A Veggie Venture. Alanna invites bloggers to use the icon on posts to signify farmers market fresh veggies. Thanks Alanna! You’re quick on the draw, for sure, Bruno! I’m quite sure you’re the first to use “Blush” — and what a great post to do so! It’s a shame I can’t enlarge the pictures. I always thought it would be funny to see yourself or someone you knew (another food blogger?) in the photographs taken by a visitor. Alanna – Thanks! And thanks again for “Blush”, it’s such a great graphic!! Sam – I’ve been trying to fix my blog so you can enlarge the photos. It was working the day I did the post and is working when I’m in the site admin., but still is not working when you view the blog directly from the web. It’s very frustrating! Do you or anyone else have any suggestions on how to fix this problem? The problem w/ the photos is fixed… you can now click the images to enlarge and zoom in. Thanks for all your help Dave!! 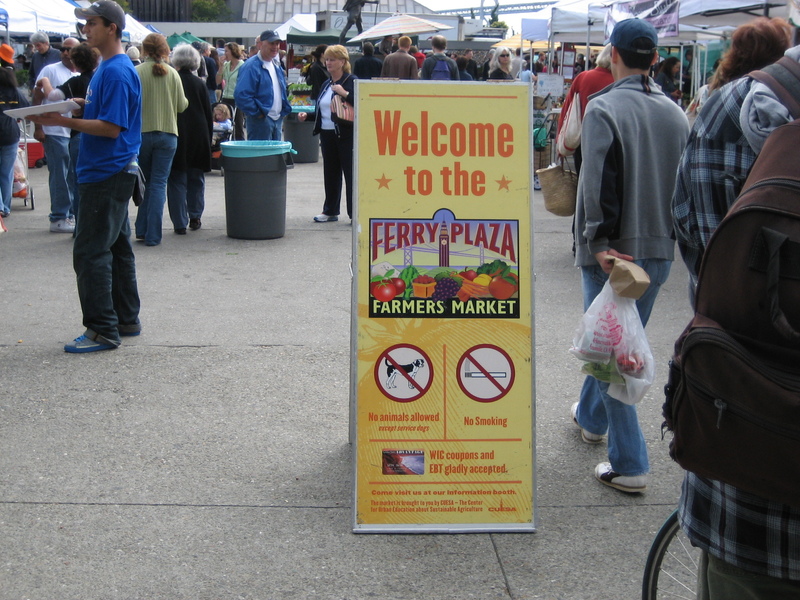 Bruno, how lucky you are to have visited the Ferry Plaza market. There’s nothing else like it. It almost makes me hyperventilate a little. Ivonne – Glad I could help you reminisce!